Fig. 1. 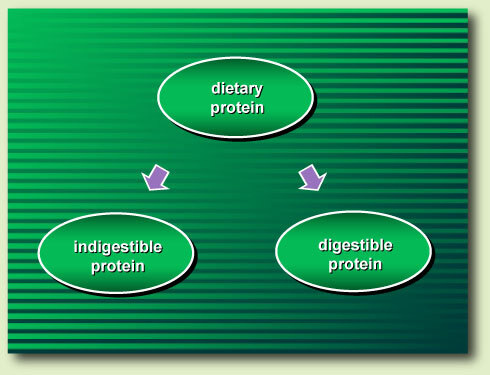 A dietary protein can be either indigestible or digestible. Fig. 2. 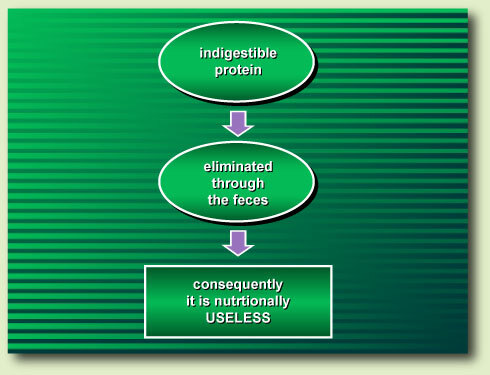 A protein is indigestible when it is eliminated through the feces. Consequently it is nutritionally useless. Fig. 3. 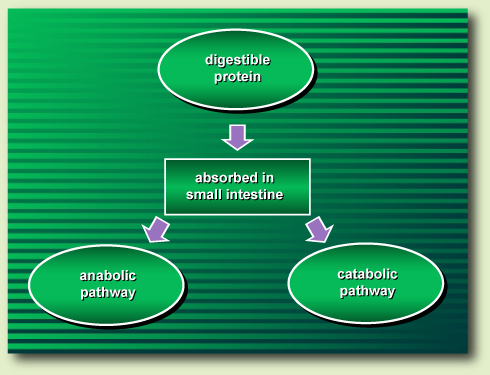 On the contrary, a dietary protein is digestible, when it is enzymatically hydrolyzed during the digestive tract thus releasing its constituent amino acids in the first 100 cm of the small intestine, where they are absorbed. 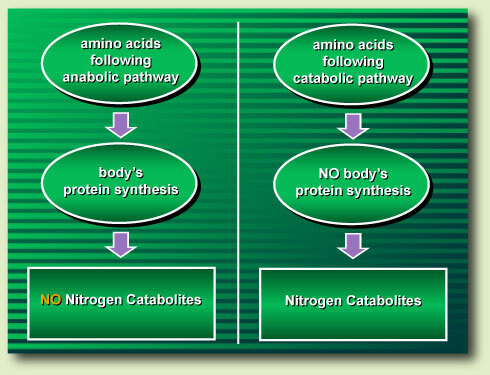 Then, those amino acids can follow either the anabolic or the catabolic pathway. Fig. 4. When amino acids follow the anabolic pathway they act as precursors of Body Protein Synthesis (BPS), which is their primary function, thus becoming the body's constituent proteins. 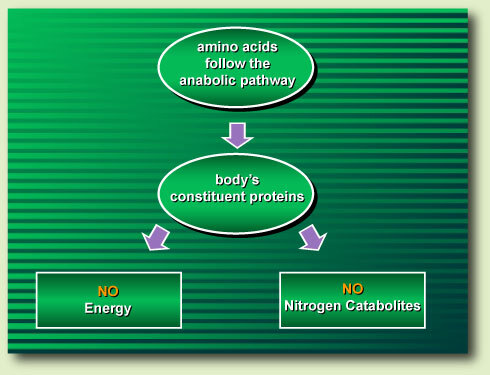 Throughout the anabolic pathway no energy or nitrogen catabolites are released. Fig. 5. On the contrary, when amino acids follow the catabolic pathway they are deaminated, which is their secondary function. Therefore, they cannot act as precursors of BPS. 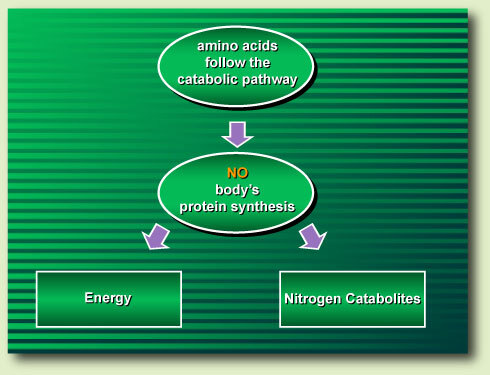 Throughout the catabolic pathway energy and nitrogen catabolites are released. Fig. 6. 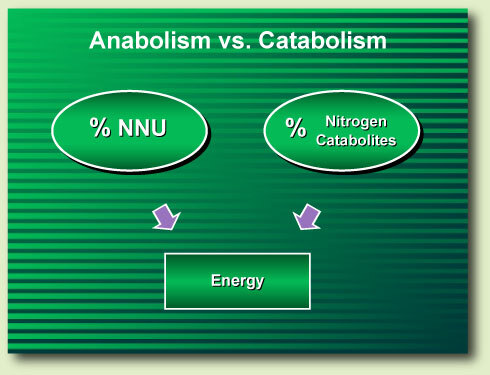 It should be noticed that the anabolic pathway has two main positive characteristics: It provides BPS and it does not provide any nitrogen catabolites. On the contrary, the catabolic pathway has two main negative characteristics: It cannot provide BPS and it does provide nitrogen catabolites, which are metabolic toxic waste. Chart 1. 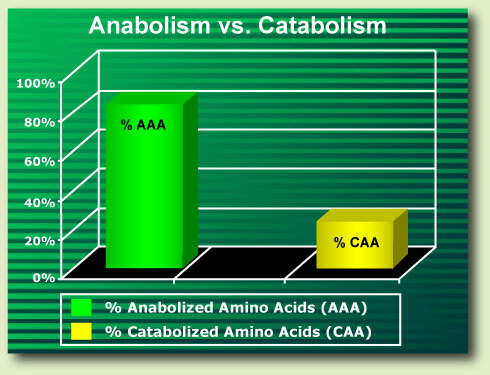 The percentage of a protein’s anabolized amino acids is inversely proportional to that of those catabolized. Therefore, the higher the percentage of AAA, the lower that of CAA and vice versa. Fig. 7. The percentage of amino acids following the anabolic pathway, to act as precursors of BPS is equal to its Net Nitrogen Utilization (NNU). 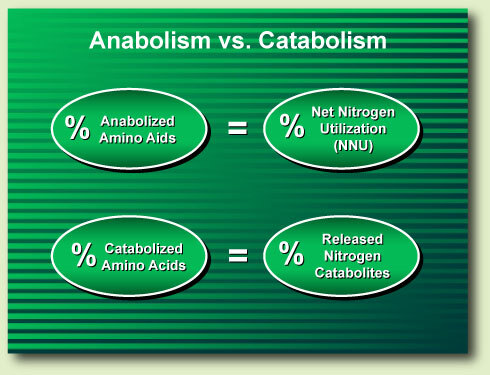 Meanwhile, the percentage of amino acids following the catabolic pathway is equal to the percentage of released nitrogen catabolites. Fig. 8. 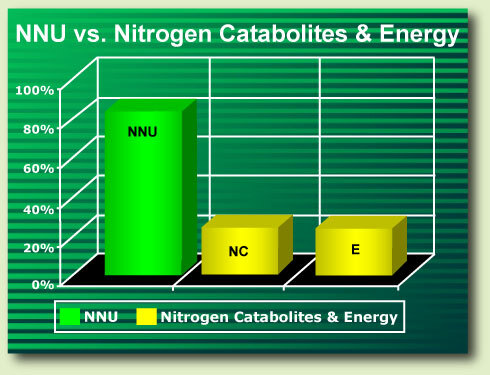 Thus, by knowing a protein’s percentage of NNU or released Nitrogen Catabolites, its released amount of energy can be determined. Fig. 9. A protein NNU is the unit of measurement for BPS. It is calculated through a methodology known as “body nitrogen balance”. Fig.10. 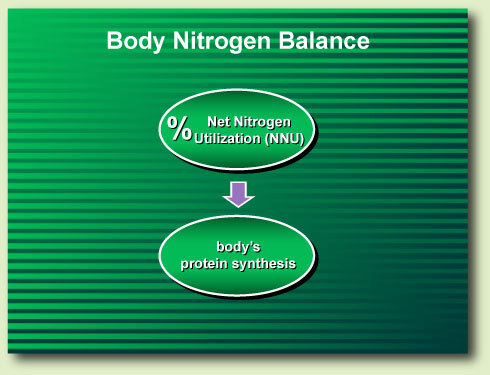 The body nitrogen balance has been a fundamental analytical technique during the last 160 years. 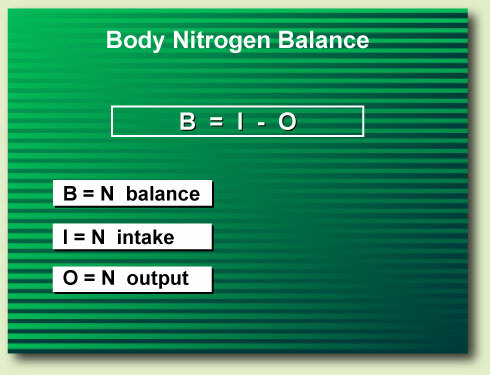 It can be applied by using the shown equation: where "B" is equal to Nitrogen Balance; "I" is equal to Nitrogen Intake proceeding from dietary proteins; and "O" is equal to Nitrogen Output. Fig. 11. 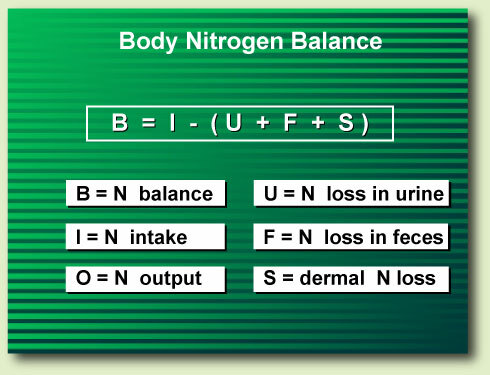 "O" in turn is the sum of U + F + S: where "U" is equal to Nitrogen loss in urine; “F" is equal to Nitrogen loss in feces; and "S" is equal to the dermal Nitrogen loss. Chart 2. A protein's NNU for BPS, represents its nutritional value. Thus the higher its NNU, the higher its nutritional value and vice versa. Chart 3. 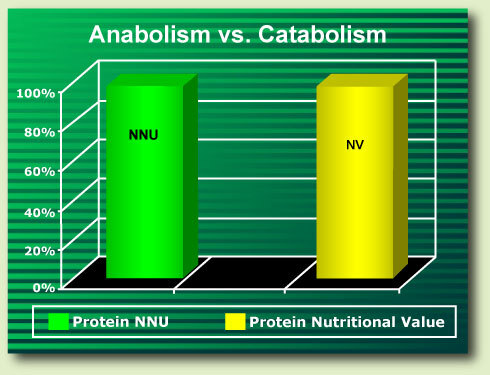 Meanwhile, a protein NNU is inversely proportional to the amounts of nitrogen catabolites and energy that it releases. Therefore, the higher a protein NNU, the lower its released amounts of nitrogen catabolites and energy; and vice versa. Chart 4. 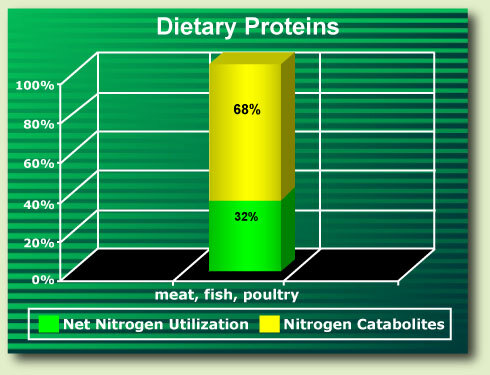 To illustrate: the most nutritious dietary proteins, such as meat, fish or poultry provide an average of 32% NNU. This means that only 32% of their constituent amino acids act as precursors of BPS, to become the body’s constituent proteins. Meanwhile, the remaining 68% are catabolized, thus releasing nitrogen catabolites and energy. Chart 5. 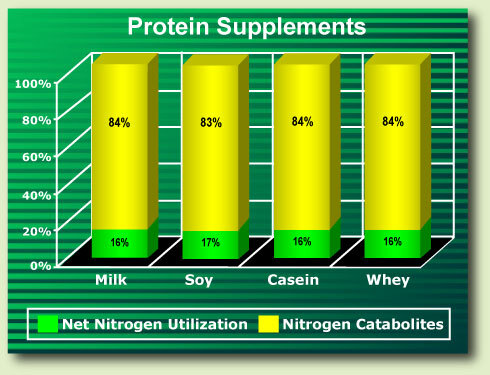 On the other hand, milk, soy, casein or whey (the main proteins found in most protein supplements) only provide an average of 16% NNU. This means that only 16% of their constituent amino acids act as precursors of BPS. Meanwhile, the remaining 84% are catabolized, thus releasing nitrogen catabolites and energy. Fig. 12. 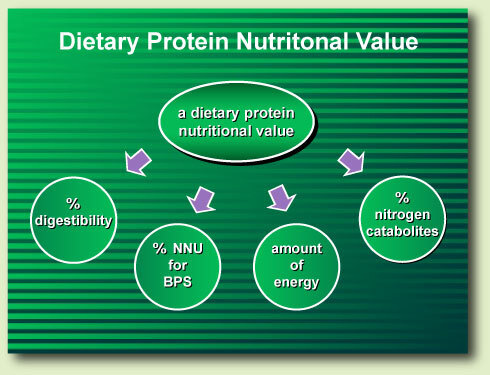 To conclude, a dietary protein nutritional value can be evaluated by four parameters: the percentage of its digestibility, the percentage of its NNU for BPS, the amount of its released energy, and the percentage of its released nitrogen catabolites. ©2014 International Nutrition Research Center (INRC). All rights reserved. No part of this website may be reproduced or distributed in any form or by any means, or stored in a database or retrieval system, without the prior written permission of the INRC. © 2014 International Nutrition Research Center, Inc.